TERMS AND CONDITIONS 1. Interested qualified candidates should submit application in the prescribed format duly signed with copies of relevant certificates to prove age, qualification & experience etc. 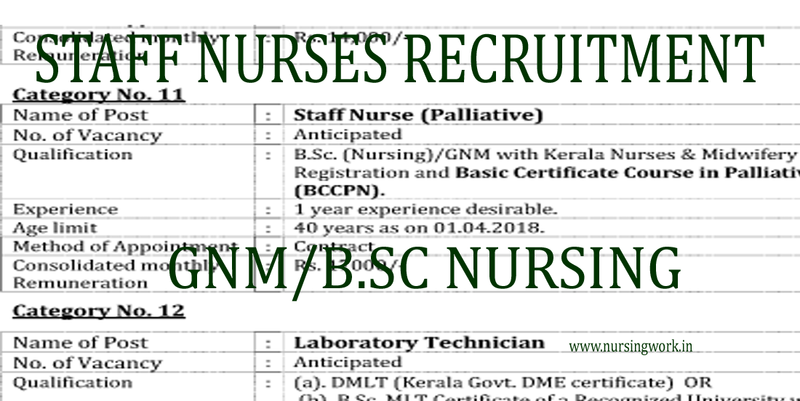 on or before 15.11.2018 at 5 pm at Arogyakeralam Office, Kannur by postal or currier service in the address of District Programme Manager, National Health Mission (Arogyakeralam), 2nd Floor, Civil Station, Kannur–670002 (application through the e-mail will not be accepted). Application format can be downloaded from website www.arogyakeralam.gov.in (opportunities) regarding this notification. 2. Application not in the prescribed format will not be accepted Selection will be based on qualification, experience and performance in objective type written test/ interview (no objective type written test for the selection, if the number of candidates is less). 3. A final rank list will be prepared on the basis of interview. The validity of rank list will be one year from the date of publication or otherwise decided. 4. The successful candidates will be appointed on contract under District Health & Family Welfare Society (Arogyakeralam), Kannur. The selected candidates appointed on contract will have to enter into an agreement with the Society in stamp paper (cost of stamp paper presently Rs.200/-). 5. Claims in respect of qualifications/experience etc. should be supported by copies of relevant documents; candidates may be required to produce the original certificates at the time of interview. 6. The posts are temporary in nature during the period of the operation of the Mission. The contract of the selected candidates can be extended according to the directions of NHM, Government of India/Government of Kerala in the matter. Candidates selected reserves no claim for permanency of job or labour claims to the NHM, DHS or the Government. 7. No TA/DA will be paid for attending the test/interview. 8. All selected candidates will be governed by rules and regulations of NHM in force from time to time. 9. Any disputes in service matters will be subject to final decision of the Executive Committee/Governing Body of District Health & Family Welfare Society, Kannur.